If you’re a car boot sale enthusiast you may well know about this little bit of wartime history. For three miles SW of Morpeth, near the village of Tranwell, lie the fading remains of a short-lived World War II airfield once known as RAF Morpeth – aka Tranwell Airfield. It existed for a few short years in the 1940s, but has now lain fallow for more than sixty years. Constructed from 1941, it was opened the following year as ‘No.4 Air Gunnery School’, and was handed a collection of ungainly Blackburn Bothas for the purposes of training up student airmen – with around 4,000 young men passing through its gates during WWII. The Botha was essentially a failed torpedo bomber, relegated to a training role early in the war. Other, more reliable, aircraft were to be found at Tranwell, but it was the Botha which was to be most infamously linked to the site – and which was to account for several fatalities during the base’s short life. Essentially, the Bothas were heavy and underpowered – and the airstrips at Tranwell were only just long enough to take them. Several incidents in a few short months were punctuated by two especially notable accidents – the first occurred in November 1942 when two planes collided on the same runway, resulting in one death. Then in March 1943 two Bothas collided over the base, killing ten young airmen (average age 20) – five of whom were from The Netherlands. All are buried at St.Mary’s Church, Morpeth. With its appalling safety record the Bothas were eventually replaced by Avro Ansons in July 1943. In time, demand for air gunners dimished and RAF Morpeth/Tranwell was closed in December 1944 – the substantial numbers of staff being reassigned elsewhere. A few months later the site reopened as No.80 Operational Training Unit, pairing Free French pilots with the famous Spitfire – though this only lasted three months before the base became a Maintenance Unit. Activity diminished thereafter before it was closed for good in 1948. Many of the overseas men who spent time at Tranwell – including a large Polish contingent – settled in the region after the war. A few relics remain, including an underground control room, but the site is today a car boor sale haven. Proposals to reactivate the airfield and/or create a museum there in recent years have come to nought. A couple of miles north-west of the Northumberland village of Stannington, pretty much in the middle of nowhere, there once stood two really quite extraordinary medical institutions. Until their closures in the 1980s and 1990s respectively, Stannington Children’s Hospital and St.Mary’s Asylum were two of the most interesting places in the North-East. 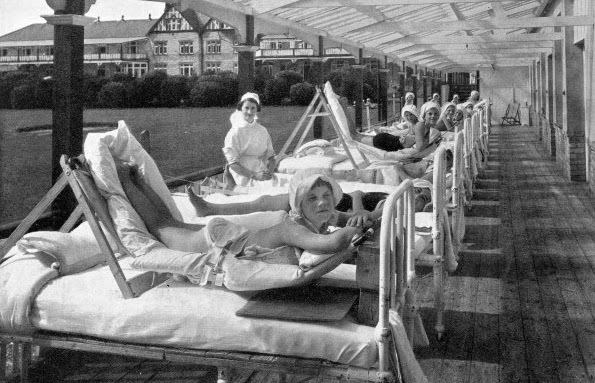 The former, known more commonly as Stannington Sanatorium, was the very first purpose-built children’s TB hospital in the UK. Opened in 1907, it was built specifically for the needs of youngsters suffering from the disease in the days before the use of antibiotics. Fresh air, exercise and good nutrition were the order of the day, as well as the use of cutting-edge medical techniques – and all done with remarkable frugality due to much voluntary support. It was originally known as ‘Philipson’s Colony’ after one Roland Philipson who had made a generous donation to the appeal for the campaign by the Poor Children’s Holiday Association for just such an institution. In the seventy-odd years of its (sometimes controversial) existence around 11,000 youngsters passed through its doors. The nearby St.Mary’s Hospital was, somewhat strangely, Gateshead’s official lunatic asylum. Built to the designs of George Thomas Hine during 1910-14, it served as the home of the town’s mentally ill until as recently as 1995. Almost immediately after its opening it was requisitioned by the military for the duration of World War I, but was thereafter returned to Gateshead who added a nurse’s home in 1927-8 (and otherwise modified the site) – before adding yet more buildings in the late 1930s, making St.Mary’s a sizeable concern in its ‘heyday’. The old asylum site is now disappearing fast under new (and ongoing) development – the old children’s sanatorium up the road having been obliterated several years ago. The few of us who still celebrate Midsummer's Eve now do so at the back end of June. A handful of ancient celebrations persist throughout the British Isles, but Whalton’s ‘Bale Fire’ is a little different from the rest. The residents of Whalton, you see, mark Midsummer’s Eve on 4th July – a fact easily explained by the change here in the UK, in 1752, from the Julian to the Gregorian Calendar, when we all made a ‘jump’ of several days. The minor furore caused by this shift was eventually overcome and, in time, almost everybody made the transition to the ‘new’ date for Midsummer. Not the villagers of Whalton, though. They would not be moved. And since 1903 it is the only village in the country to have maintained the curious ceremony on the wrong date. Or should that be the right date? The word ‘bale’ (sometimes shown as ‘baal’) is derived from the Old English Bael or the Old Norse Bal meaning a great fire (it is possibly the name of an old sun god), and in Northumberland seems to have survived as a word used to describe a beacon fire lit on a prominent spot to warn locals when raiders were on their way from the north. These days the ‘bale’ is a modest bonfire on the green by The Beresford Arms pub, around which the local children and Morris dancers jig and twist – after which all present adjourn to the village hall for refreshments and yet more dancing. Interestingly, during the black-out in World War II a few twigs were lit and quickly put out to preserve the tradition! Head north on the Great North Road and, a little short of Stannington, you will stumble upon an old relic of Newcastle. 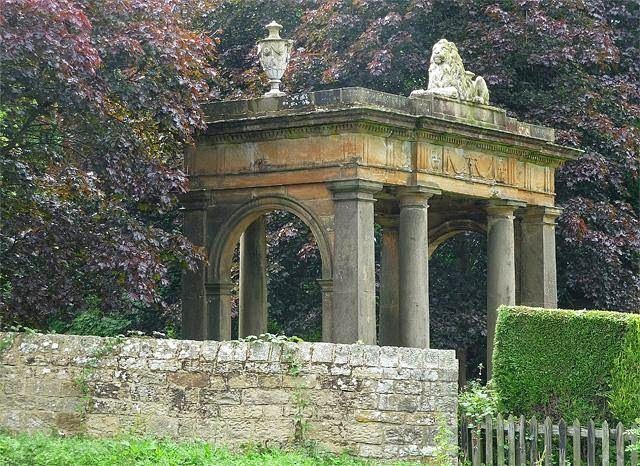 The strange classical form standing near the roadside, and within the bounds of Blagdon Hall, is Cale Cross, looking more like a daft rich man’s ornament than anything else. Unusually, though, we have here a ‘folly’ that has – or rather had – a practical use. For it once stood at the heart of old Newcastle, marking the spot where cale (cabbage)* and other foodstuffs were once sold – a sort of mini-market which gathered at the town’s Sandhill area, near the present-day Guildhall on the Quayside. It also acted as a conduit head for some time. A commemorative plaque now marks the site, attached, as it is, to the modern-day Cale Cross House near the footings of the Tyne Bridge. But however did this old landmark find its way to the grounds of a stately home several miles away? Well, Blagdon Hall, as you may know, has long been the home of the White Ridleys; and the Sandhill area of Newcastle has long had a ‘Cale Cross’ – at least as far back as 1309. For many years a more ancient ‘cross’ structure marked the spot, but this was replaced by a fancier design in 1783 – drawn up by architect David Stephenson and paid for by Sir Matthew White Ridley. However, nice though it was, it soon got in the way of the local traffic and a decision was made in 1807 to dismantle it. The White Ridleys, presumably somewhat miffed at the corporation’s change of heart, ended up carrying the said structure stone-by-stone to their ancestral home and throwing it up at the side of the main road north – for no other reason than it seemed a shame to ‘hoy it oot’. And so, like a nineteenth century Angel of the North, it sits in a prominent spot near a major thoroughfare so that passers-by can have a good gawp. And why not. It is rather splendid. * Some think the word ‘cale’ is derived from kail wort, a herb used in making broth and which may have been sold at this spot in Newcastle. The man who would become the first (and last) individual to be known as Lord Kirkley was born as William Joseph Noble in Newcastle in January 1863. He married Margaret Dixon and they had four children. Noble made his name and his considerable fortune in shipping – primarily with the Cairn Line – and rose to serve as president of the Chamber of Shipping in 1920. On his way to the top of his profession he also served on the Tyne Improvement Commission and acted as an advisor to the Ministry of Transport. He served on a number of national and local committees during World War I, and led the British Economic Mission to South Africa in 1930. 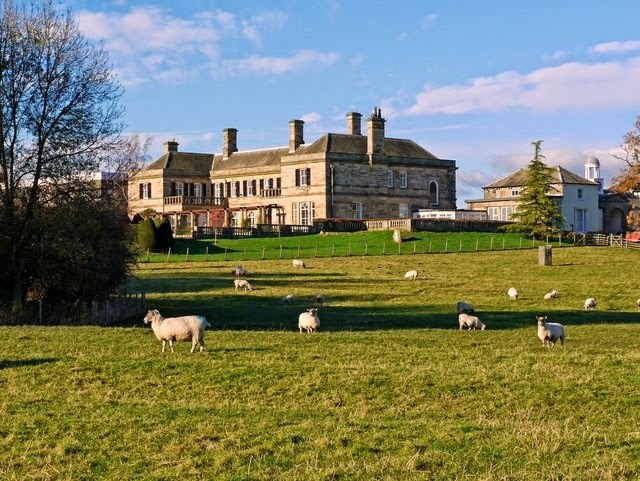 By this time he was a Baronet and when, in 1928, he bought Kirkley Hall in Northumberland from the Ogles, he soon found himself bearing the title of Lord Kirkley. He was to die, aged 72, in 1935, but the last few years of his life were eventful enough. First off, his wife, Margaret, died in September 1928 and was interred in Ponteland churchyard. Then his newly acquired mansion was almost completely destroyed by fire in 1929 – which he quickly rebuilt in much the form we see today. Keen to do all he could to upset his rival, Sir William then hit upon the idea of exhuming his wife’s body from Ponteland churchyard and reburying her in the garden of his own little chapel … and in very much unconsecrated ground. When the old man himself died in 1935, he joined her. And with no surviving sons to inherit his title, that was the end of the Lords of Kirkley, too.